There are plenty of new men’s fragrances to review this spring, but before reviewing Chanel Allure Homme Édition Blanche, I thought it might be interesting to smell and “discuss” the previous Allure offerings for men (both created by Chanel house perfumer Jacques Polge) — Allure Homme and Allure Homme Sport. Allure Homme contains bergamot, mandarin, citron zest, pepper, vetiver, patchouli, sandalwood, tonka bean and labdanum. The fragrance starts off with an artificial-smelling, alcohol-y and acidic accord; these opening notes are, to my nose, ugly, harsh and sour. Thankfully, Allure Homme’s opening notes begin to subside within 10 minutes’ wear and what comes next is a hazy, well-blended mix of woody, vanillic and earthy notes. The note or accord I’m calling “earthy” is not dirty enough to be called “sweaty”; I guess I would call this note “flushed” or “blushing” (is it ‘neutered’ labdanum?) Except for its rough opening, Allure Homme is not a bold perfume — its vetiver, pepper, patchouli and labdanum are all faint-hearted and wan. Allure Homme is a middle-of-the road scent: it has mid-level sillage/strength, mid-level quality, mid-level complexity and mid-level pricing. Allure Homme wears down to a light musk-amber aroma that is not unpleasant — but these days, what men’s mainstream fragrance DOESN’T dry down to that accord? I don’t have to like a fragrance for it to grab my attention or inspire my imagination (Rochas Lui is a perfect recent example). If a fragrance is sublime, monstrous or ‘just’ interesting, I can get fired up about it. Allure Homme Sport (just like Allure Homme) is neither great (nor awful) and it holds no interest for me: it’s dull. Allure Homme Sport contains mandarin, orange, aquatic accord, black pepper, neroli, cedar, tonka bean, vetiver, amber, white musk, and aldehydes; its opening is similar to Allure Homme’s — and almost as unpleasant. As often happens in modern men’s fragrances, the notes of Allure Homme Sport seem blended into a mishmash accord that is unvarying in its simplicity and “freshness.” The only mildly appealing aspect of this fragrance is a creamy citrus aroma that I can smell only if I put my nose right up against my Allure Homme Sport-saturated skin (and that note disappears quickly). Allure Homme Sport is so plain and static, it makes Allure Homme seem mysterious and complex by comparison. If you are new to perfumery, you may find Allure Homme Sport novel; but if you are an old hand at perfumery, you will have smelled this type of fragrance dozens of times under dozens of brands and names — MEN’S FRAGRANCE (insert name) = fresh ozone/marine accord + citrus + cedar + vanilla + powdery musk. To make matters worse, Allure Homme Sport turns stale on my skin within an hour of wear. With all the wonderful (and refreshing) perfumes that can be had at Allure Homme Sport’s price (pick almost ANY of the Parfums de Nicolaï men’s or unisex fragrances for instance), who’s buying it…and why? I love many Chanel perfumes and quite a few Jacques Polge creations, but the Allure offerings for men add nothing special to the Chanel fragrance line (except, perhaps, lots of CA$H). After smelling Allure Homme and Allure Homme Sport, I’m anxious to try Allure Homme Édition Blanche — with but a soupçon of creativity/boldness, it could easily surpass its predecessors. Allure Homme and Allure Homme Sport are widely available at department stores and online discounters. Hey Kevin nice review. I got Allure Sport a couple of weeks ago and even though I like it don't think I'll be using it very often, still haven't found a fragrance to replace Unforgivable. Loved Allure but now it's a bit… boring? AHS I'm warming to after the initial dislike for it's linearity and overall cheap vibe. K, did you deliberately skipped reviewing AHS Cologne? Honestly I don't know a lot about fragrances, I just bought Fleur du Male and Prada Amber and from what I read on your reviews I don't think they're summer fragrances. What's your must-have fragrance for summertime? Ernst: I have no “must haves”…I'm fickle. But last summer I wore (among many): Guerlain Vetiver, Hermes — Terre d'Hermes, Jardin Sur le Nil, Jardin en Mediterranee, Annick Goutal Eau de Sud and Duel. ALL nice and fresh. I may need to get some of Parfum d'Empire's osmanthus scent for summer and something “tea-y” too…. I'm gonna get one of those or maybe two. Thanks. Thanks for your review Kevin. I agree with you that both “Allure” scents have nothing special/memorable. They are both pleasant/easy to wear fragrances but quite complimentary (maybe that's why both are still very successful here in France). I would love to have your opinion on AHS Cologne Sport which I wore last summer and which is still on sale here in 2008. In my opinion, it is really different from AHS eau de toilette: sparkling but much more natural, less trendy/more timeless. I really like this one better than the 2 other versions but it is more a beautiful “body splash” than a real perfume. Regarding Allure Homme Sport Edition Blanche, I smelled it quickly last week. It doesn't smell very unique either. It reminds me of Eau d'Issey pour Homme: fresh, spicy and woody. I am anxious to read your thoughts on this one! K, have no idea if it's been dc/d, may well have been since it was meant to be a limited edition, but I still see it most everywhere. AHS Cologne I felt was a bit different than its older brothers in that it has a warm cotton-like (plenty of white musk there), skin-scent dry down with a bit brash citrus (grapefruit) top note. It's available in 150ml size only and you'd think the juice is feather-light, but boy does it last and last. I liked it, but not enough to buy it, and certainly not in that gigantic bottle. Etienne: I couldn't find the Sport Cologne anywhere and don't believe it's on the Chanel website anymore either…and agree…there is a similarity between Allure Homme Edition Blanche and Eau d'Issey…but I like the EB better. I got a sample of Allue Homme Sport about a year or so ago and I remember liking it well enough, and more than many others in the same category that I've tried. However, I stopped by a frag counter a month or so ago and tested it on my skin again, and it's definitely nothing I would need to own. Even though I've loved Acqua di Gio for a long time (though I rarely wear it anymore), I don't feel I need anything similar in that category. Still, AHS seemed well done for what it was, and certainly pleasant enough as an everyday spring/summer fragrance (for someone else… haha). Speaking of must-haves for summer, I know I'm going to pick up a full bottle of PdN's Balle de Match, maybe Guerlain Acqua Allegoria Herba Fresca, and whatever else I fall in love with before then. I do love the Terre d'Hermes I bought recently, but found that it is so fleeting that I need an EXTREME or INTENSE version — I could easily go through 50ml in one month. I have the same problem with Jardin en Mediterrannee. Guerlain Coriolan may end up being another summer staple — I've fallen in love with it even though it's dc'd. And I need to get my hands on a sample of AdP Colonia Intensa. Kevin: for something “tea-y”, you may want to try L'Occitane's Green Tea; it's on the sweet side, but I find myself wearing it a lot as a comfort scent, and the price can't be beat. I've been wanting to pick up some samples of Bvlgari Au Thé Vert for comparison, and also Hermès Yunnan Osmanthe to see if that works on me. Any new-ish tea scents out there I might be forgetting? I've been spraying Edition Blanche a lot lately, and I don't see anything 'fabulous' about it. On the back of the tester bottle it reads “Fresh, Spicy, Woody” and one other category that I can't recall off the top of my head. It's predominantly 'fresh'; I don't get woods at all, but I also don't bother waiting for the dry down. Anyway, it's off to a modest start, but I think it'll simply be an alternative to DG Light Blue wearers. Nothing terribly exciting happening with this edition, I'm afraid. Joe: I keep meaning to order (unsniffed!) the Fig Tea from de Nicolai. I love BLACK TEA aroma…a more robust scent than green tea in fragrances. I much prefer the Parfums d'Empire osmanthus scent to the Hermes…R reviewed them both. Joe: forgot about the Colonia Intensa…I'll certainly be dousing myself with that this summer. STRANGE about the Terre d'Hermes and Mediterranee…they last on me for at least 10 hours! But maybe I'm more liberal in the spritzing? 10 spritzes? HA! Hi, Bartamy: I agree that Edition Blanche is in the “Light Blue Category” but I like it much more…less artificial. Also, happily, I do get sandalwood in the drydown…mixed with musk. 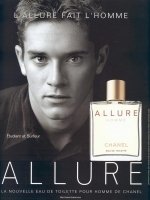 Ok, I first smelled Allure Homme when I was 17, and I vowed that my husband would one day wear that scent. three years later, in Germany, I showed it to my brother, who loved it and bought it, against my pleas not to. I then related this story to a work associate that I saw often but was not at all attracted to, and showed him the scent, and he promptly bought it. Alas, my favorite scent is now attached to my brother or a work associate. While my tastes have matured, I still have an affinity for Allure. Anyone who wants to try a more interesting, updated version may look into Pecksniff's Oriental Woody or Aromatic Chypre. Also..AHS smelles like a poopy Aqua di Gio. I just wanted to pick up on something Ernst87 said earlier regarding Prada Amber not being a summer scent. I absolutely would wear this in the summer, it is fresh, lightly fragrant and smells fantastic. Can't comment on the other one. Going back to the Allure debate, I have the original Allure and I like it, it's a nice light fragrance and is, as someone else observed “pleasant” and non-offensive. During the summer I am likely to be wearing Guerlain's Vetiver, Heritage because I can wear it anytime, Eau D'Hermes and if I want to go sweeter I'll go Desir by Rochas (which nobody seems to know anything about but I really like it), I also like Ghost Homme in the summer. To be honest though when it's hot, I quite like the winter frags, because if you put just a leeeetle bit on they last ages and smell great. Joe – are you sure Terre is fleeting? I've been wearing it since last year and find that I need no more than one squirt or dab on either side of the face to last all day! I agree with you about Coriolan (or Ame D'Un Hero as it is soon to be known as) too. I've just ordered the male Fracas by Robert Piguet because I quite like male versions of florals and I feel comfortable wearing them. Good to hear, Kevin. I'll spray it on my skin today and wait for that sandalwood. HDS1963: the Fracas for me is almost pure sandalwood … unfortunately no flowers (for me anyway)…I don't even know why they called it Fracas. Yonahleyah: goes to show you to be very careful what cologne you present to others! Allure Homme has lots of fans… I assume it's a good seller. how many spritzes should one wear? How many is too much and how many is just ok for others too feel your fragrance at a 1 meter distance but not suffocate? 1 or 2 is usually too little for others to undersatnd that I wear perfume at all – not those who embrace me – but how many people a day you usually embrace – not many. So, what distance is polite and how many spritzes do you need for that level? Kevin that's really really interesting, because many people report the contrary. I am looking forward to receiving it which should be tomorrow – I'll let you know what I think. But hell, I only paid £12.50 for it. That's less than some of that Beckham muck! I always have to remember that a designer frag is a designer frag. There's a lot of mass appeal in its intentions, but I believe Allure Homme had an appeal that I could appreciate because of the creation of Egoiste Platinum–nothing like the original Egoiste, and above all just too safe, too much mass appeal. Haven't smelled Allure Homme lately, but I agree there's a linearity to it, but I definitely know that it had heft and a lot of sillage in the past, thanks to its overdose of tonka and musk, which is what I smelled a lot of in its duration of 8 hours plus on me. Geez, is it another victim of a cut in concentration too nowadays? I do enjoy Allure Homme Sport, I swear I don't smell much of its aquatic personality, but I do notice the an injection of vetiver to give some space between the dense tonka and musk. Much more wearable, because the original was very dense and actually gave me a headache despite my desire to smell the warm sweetness. Allure Homme Sport Cologne is sacrilege! A pollution of chemicals to add waste to the world and environment. I'm amazed it wasn't bottled in plastic and made immediately available at a drugstore. I'm not too excited to smell Edition Blanche, but all I can do is have hope that at least it smells pleasant. Nothing can be revolutionary if all Houses are putting out something on a 6-month schedule. Kevin! Great review and I totally agree! Never understood the fuss about Allure Sport, in fact, I hat hate it. And this boring marketing… for years now you see the ads everywhere! A friend wore Allure (98) and I didn't like it, or, let's say I thought it was forgettable. I wonder if us ozonic/marine haters putt off a lot of blogg readers… I must say in the mid-nineties I did quite like Kenzos “algae” scent (that dark prussian blue bottle with the wood structure, which they now sadly stripped off when it got redesigned), though not on myself. And I really like one ozonic fragrance: Lanvin OXYGÈNE. I haven't smelled it for a while – bought it for a friend years ago – but it's really fresh & citrussy with a wonderful cedar accord and an uplifting ozonic note. I guess I liked these because they are so obviously marine/ozonic (even the name) and they don't have that sour, metallic, penetrating aspect to them. iMav: I like the older Chanel scents for men…even the “diluted” Chanel Pour Homme…certainly the original Egoiste. Of the three Allures I write about Edition Blanche is my favorite…it IS pleasant without being dull on my skin. Lars: excellent choice of words you use to describe the FRESH scents I hate: “sour, metallic, PENETRATING.” I wish I could remember the one fresh scent I liked…it was by Kenzo and I bought it in the nineties: it came in a black matte glass bottle with some bright colors on it! HA! I wonder if it's even made now…should investigate. Yes, I have a bigger size of that ad…pourquoi? I collect ads/ad images. *blush* Would you mind posting a link to it, please? The only other one I've been to find online from Google Images is still pixelated. I've sent you an email. Thanks sooo much! This has been my bros signature scent for about 5 yrs now and well, im sick of it! I never liked it. He recently ran out of his last bottle and i want to get him a new cologne for his bday nxt wk. Anyone have suggestions? Maybe something similar but you know, better? Hes turning 22 if that helps. Thanks! Sorry, Allure Homme Sport, not the original.